Sorry I've been so MIA, work has been so busy lately and with the terrible heartbreaking news that came from Manchester earlier this week it just didn't feel right to blog. I am back though with lots of great content for the summer and I'm dedicated to work hard on my blog because I enjoy it so much and I've missed it all. I am also going to NYC in July and to Krakow in September so there will be some fab content coming your way. Anyway onto the blog post. We've all had those days where we've tried to be productive and majorly failed and hours later we find ourselves still in bed scrolling through the same posts on instagram having achieved nothing. Now we all need those days sometimes to give us a kick up the bum and help us to be more productive the following day. Today i'm sharing with you 5 tips to having a productive day. I can't say that I always stick to this but when I do it's honestly a godsend and saves so much time if you're in a rush to get things done. Half an hour before I go to bed the night before I will try and set out my outfit/make up and prepare my lunch and bag (if i'm going to work). This is so easy to do but can save you a hell of a lot of time in the mornings. If i'm going to be spending the day at home blogging (for example during the weekend) I will still try and do the same thing as this helps me to not stay in my PJ's all day being lethargic and wasting time! I also like to set up my laptop/I Pad and blogging notebooks too so I've literally got to get dressed and sit down with a cup of tea. I also sometimes like to treat myself and do my nails as well as it always makes me feel 100% times better! I am actually quite good at this. Don't get me wrong there are times when I hit snooze on my alarms numerous times but I do tend to get up quite early (even on the weekends) and it helps me to become much more productive. Its so important to set yourself goals or write down a to do list so that you can tick things off as you go. This is so effective and means that you can manage your time to ensure everything get's done. Although it's important to set yourself goals for the day you've got to remember to be realistic. No one is going to tick off 50 things on a to do list in an 8 hour working day so be selective, choose goals that are achievable and are attainable. I always have a much more productive day if I eat nice healthy meals throughout the day. If i'm at work I make sure to always try and prepare my lunches the night before and I will usually either have a nutritious soup or a salad of some sort. For breakfast I try to eat weetabix and drink water and lemon throughout the day, then for dinner it's usually some form of meat or fish, salad, vegetables and sweet potato. 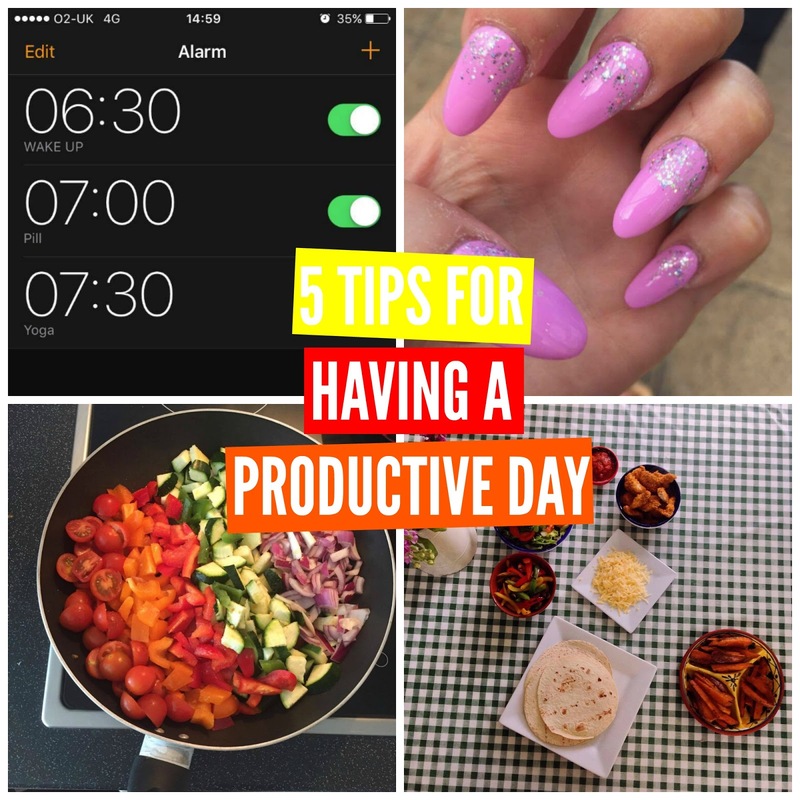 There you have it, I hope you all enjoyed hearing my top tips for having a productive day, let me know yours in the comments below.